Awarded to officers in command of a unit of at least company size which has achieved high ratings in training exercises over a period of at least one year. During this time, the recipient must have served actively with his unit and displayed a documented high standard of conduct and behavior. Subsequent awards are indicated by the addition of a bronze oak leaf to the ribbon. This medal was also awarded to Saudi Arabian troops. This medal has also been incorrectly associated with the Syrian Golan Heights campaign of 1973-74. 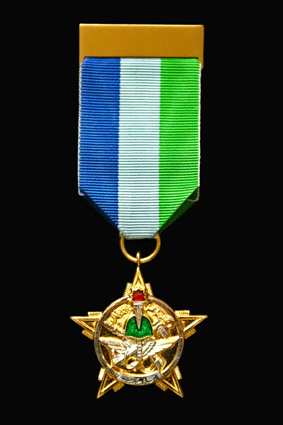 Obverse: A 42-mm five-pointed gilt star with a circular center bearing a green-enameled helmet, crossed anchor and rifle, with horizontal wings; through all, there is an upright torch with red-enameled flames. Above and below, Arabic inscriptions; "To sweat in peace saves pain in war" above and "Wissam al-Tadrib" or "Medal of Training" below. Suspended by a ring. Ribbon: 31 mm, divided into three equal stripes (left to right) of blue, bluish white, and medium green. A bronze oak leaf is worn on the ribbon to indicate a second award. This ribbon has been sometimes incorrectly depicted as equal stripes of black, gray, and black.